Notes: This received a short-lived VHS release in the United States under the same title and has not been re-released on DVD since. It is also based off of a picture book that has only been released in Japan. According to some sources, this was due to be re-released on DVD sometime in 2014. Chirin is an energetic young lamb living an idyllic life on a farm with his mother. He was always told by her not to venture outside of the gate so that he would not be eaten by the Wolf King, a ferocious wolf that eats lambs. One night, the Wolf King attacks the herd and kills Chirin's mother while she was in the process of protecting Chirin. Confused, saddened, and enraged, the little lamb confronts the wolf and demands that he takes him as an apprentice so that one day, Chirin can be strong like the wolf and kill him. Ringing Bell begins as more of a production that would befit the style of a classic Walt Disney animated feature. 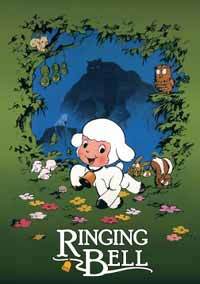 The colors are bright, the animals talk in a cute manner, and the character Chirin himself looks as if he could be a lamb version of Bambi. Ringing Bell looks, and feels, like Bambi in terms of style but as far as this anime is concerned, it is a cautionary fable that does not try to soften its emotional blows. Animation wise, Ringing Bell has some pleasant colors and has aged well, despite the fact that it was made in 1978. The director, Masami Hata, uses character designs that scream of American inspiration, and although the animation cannot be considered as high quality as the animation of Disney, it still looks pretty and brings back a sense of nostalgia. One of the strongest traits of Ringing Bell is its ability to tell a deep and truly sad story within forty-five minutes. Although this anime was marketed toward children, there is nothing in here which takes for granted the intelligence of younger viewers. Characters die; tough subjects such as loss, revenge and 'survival of the fittest' are shown in such a blunt manner, that this anime could rival a drama which would be aimed towards adults. It is a refreshing work of animation, considering that so much entertainment that is aimed towards children is watered down intellectually and relies on gimmicks and pop-culture references to see themselves through. Needless to say, it would not be a spoiler to say that the ending of this anime is not a happy one. Morally speaking, the message of the film is a distinctly Japanese one, providing a cautionary tale of the pitfalls of vengeance and non-conformity. One striking aspect of Ringing Bell is the relationship between Chirin and the Wolf King, which starts off as a hateful partnership but as Chirin becomes stronger, the wolf becomes a surrogate father to him. Instead of relying a hero/villain motif to move the story along, the Wolf King is shown more as just an aspect of nature. In terms of sound, Ringing Bell tells a lot of its story through ballads, kind of like a Disney musical, but without the characters singing, but a chorus. For the time of its American release in the 1980's, Ringing Bell has an okay dub, but time has been just a little unkind to it. In hindsight, the Dub of Ringing Bell is tolerable and stays true to the original Japanese track most of the time. All in all, Ringing Bell is a hard line fable that does not try to talk down to its intended audience but instead crafts a story that proves that even children's films can be emotionally powerful, and that just because a story features talking animals, does not mean that it lacks depth. Interestingly enough, this anime was based off a picture book. Why this book was not translated and brought to the states but Everybody Poops was, is beyond me. Recommended Audience: This is an anime that was intended for the children in the crowd but can be appreciated by anyone.